New Delhi, Oct 27 (IANS) The Supreme Court on Friday gave its nod to new norms for worship at the Mahakaleshwar temple in Madhya Pradesh’s Ujjain city, directing temple authorities to use only RO water for ‘jal abhishek’ of the Jyotirlinga. 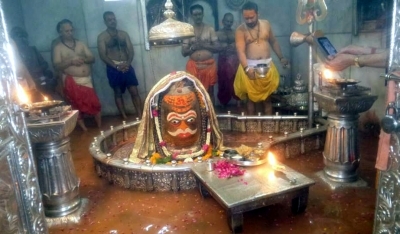 The court directed that each devotee will use only half a litre of water obtained through Reverse Osmosis (RO) process for the ritual of bathing the Jyotirlinga. As per the new norms, put in place to preserve the Jyotirlinga, 1.25 litres of ‘Panchamrita’ (combination of milk, curd, ghee, honey and sugar) is now permitted to each devotee, the apex court said. It said that during ‘bhasm aarti’, the Jyotirlinga must be covered with a cotton cloth. The also bench directed for installation of fans and dryers in the temple sanctum to contain adverse effects of moisture, offerings of flowers only on top part of the Jyotirlinga, daily cleaning of the sanctum and making only dry offerings to Lord Mahakaal after 5 p.m. The apex court’s order came after the Ujjaini Vidwat Parishad, a group of intellectuals, said that the Jyotirlinga had shrunk due to excessive ‘bhaang shingar’ and ‘Panchamrit’. Earlier, the court had formed a committee of experts that visited the Mahakaleshwar temple in Ujjain, which recommended restricting certain practices and rituals by devotees.